Carlisle Harris received his art training at Howard University, Washington, DC and was the Vice-Principal of John S. Donaldson Technical Institute in Port of Spain. He was the President of the Trinidad Art Society for many years. He works primarily in acrylic on canvas, but frequently mixes the mediums, using sand, modelling paste and oil based sprays. He recently designed two stained glass windows for the Holy Saviour Anglican Church in St Joseph, Trinidad. Carlisle's work has a definite affinity to spiritual announcements, both in their subject matters and in their titles. My journey as an artist has been both revealing and rewarding. Revealing, in the sense of discovery of ideas, forms, concepts and viewpoints, and rewarding, in that acquired growth and maturity as a result of this garnering and knowledge. The challenges that I have faced in my confrontation with technical problems and the process of distilling and expressing subject matter have contributed to my continuing development. In the past, I often got carried away in my attempts at creative articulation of some concept or philosophy and relied heavily on my conscious thoughts and intellect to produce a solution. This reliance often manifested itself in notes, studies and sketches in addition to intense contemplation. Oftentimes, the process became the end itself, and no meaningful work of art resulted. I have come to appreciate more fully the capacity of the mind, the subconscious level of our being and the brain's ability to store and absorb all of our experiences. A great achievement however, is to acquire a sustained ability to access this information. This ability, coupled with intuition, has been one of my greatest tools and I now recognize a virtual bonanza of subject matter, visual shapes, forms and situations born of past experiences. For now I am riding on that tide. 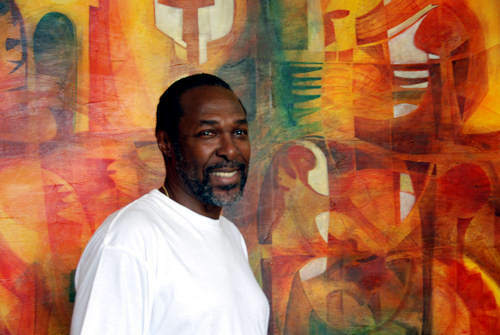 Between 1971 and 2014 Carlisle Harris has conducted many One Man Shows on his native soil at such venues as The Holiday Inn, The National Museum, 101 Art Gallery, National Commercial Bank, Ikon Art Gallery, Breton Hall, the Guardian Life Building and the Trinidad Art Society's Annual Exhibition. Abroad, he has had showings in 1989 at the Algee Kerr Gallery and the Ackwa Harrison Gallery in Canada. A One-man show was held at the Home of Dr. Miki Becker in Washington DC in 1972 and another at the Cuba Biennial, Wifredo Lam Center, in Havana in 1986 and Nigeria, 2005. Among his other accomplishments, Harris has done set designs and costuming for many theatre and television productions. In 1981 he designed the BWIA flight attendants' pin and did the print design for their in flight coveralls. His many murals decorate various sites in Trinidad, including National Commercial Bank, Riverside Plaza and Trinidad and Tobago Express Newspapers, Independence Square, Port of Spain. 1969- 1973 Master of Fine Art. Howard University. Washington D.C. USA. 1960 -1965 St. Stephen's College. Princes Town. Trinidad. 1951 -1960 Fyzabad Intermediate E.G. School. Fyzabad. Trinidad. 1971 Student Exhibition Howard University. Washington. USA. 1974 One Man Exhibition Teak Room Holiday Inn. Port of Spain Trinidad. 1975 One Man Exhibition Teak Room, Holiday Inn Port of Spain . Trinidad. 1976 One Man Exhibition National Museum and Art Gallery. Port of Spain. Trinidad. 1978 One Man Exhibition. National Commercial Bank, Head Office. Trinidad. 1982 One Man Exhibition. Ikon Art Gallery. Port of Spain Trinidad. 1986 Bienale Exhibition Wilfredo Lam Center. Havana, Cuba. 1987 One Man Exhibition. Guardian Life Building. Port of Spain. Trinidad. 1987 Exhibition of Brazillian and Caribbean Artists.Toronto Canada. 1989 One Man Exhibition. Algee-Kerr Gallery. 1989 One Man Exhibition Sapadina Group. Toronto Canada. 1989 One Man Exhibition. Ackwa Harrison Gallery. Toronto Canada. 199O Exhibition of 19th Annual Contemporary Black Artists in America. New York. 1992 One Man Exhibition 1O1 Art Gallery. Port of Spain, Trinidad. 1993 Exhibition CARIB Art. Traveling Exhibition of contemporary Caribbean Art. 1993 Exhibition. Contemporary Art of Trinidad and Tobago. Fort de France, Martinique. 1994 One Man Exhibition 1O1 Art Gallery. Port of Spain, Trinidad. 1995 Exhibition CARIB Art Gallery. Broadway, New York. 1996 One Man Exhibition 101 Art Gallery. Port of Spain, Trinidad. 1998 One Man Exhibition 101 Art Gallery. Port of Spain, Trinidad. 1999 One Man Exhibition Kirby Gallery. Hastings, Barbados. 20O1 One Man Exhibition 101 Art Gallery Port of Spain, Trinidad. 2004 One Man Exhibition International Conference Center. Abuja, Nigeria.